Some students will be invited to take vocational courses. This decision is based on their target minimum grades and their suitability. Some of these courses will take place in school and some maybe offsite. solving and decision making. In addition there is a study of the world of work including the stages involved in getting a job, finance, health and safety and employment law. Continued development of employability skills. 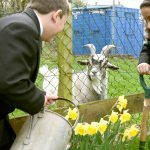 With guidance students select their own programme, built up through undertaking a series of modules such as teamwork through sport, photography, working with animals and construction. The opportunity for vocational tasters and a work experience placement are built into the programme. Some students will elect to study a qualification in either Business and Enterprise or Health and Fitness. For these students build a Portfolio of Evidence for each unit which demonstrates their understanding. Each unit is marked by their teacher and graded Pass, Merit, Distinction or Distinction*. The results of each unit are combined to give a final grade. Students select a vocational area they are interested in and follow a one year programme which supports progression. This may take place at college. The Business and Enterprise and Health and Fitness courses continue.